Seems every talking head on CNBS (and most bloggers) see nothing but blue skies for 2014. But there are negatives - the longer the market extends the bull run the nearer we are to a turn down (that is a fact and not subject to debate). So as the market moves higher I become more negative about the market future. 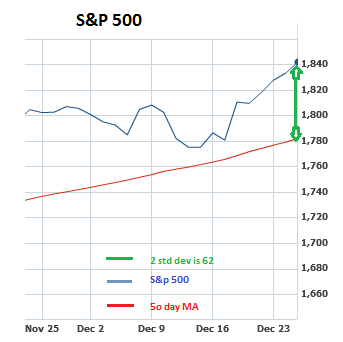 Do I know what the market will do in 2014? Absolutely not. 1). At more than two standard deviations above its 50-day, the S&P is actually the most overbought it has been since mid-May. So near term (say first quarter 2014) a correction of 10% would be normal given this. 2). The percentage of bullish individuals rose to 55.1%, the highest level in nearly three years, in the week ended Dec. 25, according to the American Association of Individual Investors. 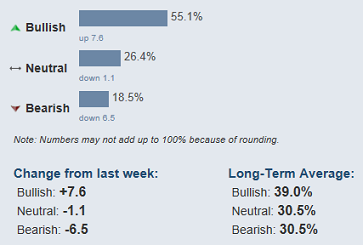 That was a jump from the 47.5% of investors who said they were bullish the previous week. See item 1 (suggests market over bought and a correction would be expected). 3). The market for junk-rated loans increased to $683 billion, exceeding the 2008 peak of $596 billion, according to Standard and Poor’s Capital IQ Leveraged Commentary and Data. We are seeing levels that break prior peaks in several areas. Expect these extremes to get corrected (I suspect sooner rather than later). 4) The talking heads on CNBS keep telling us how reasonable the PE is, but the CAPE (10 year average of price/Earning) is a better predictor of future stock action. 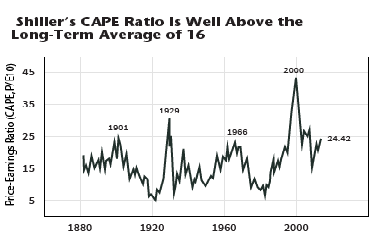 The Cape in the mid 20s is at levels more commonly seen at market peaks. 5). Stocks are rising on low volume. 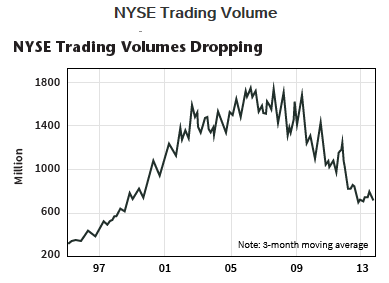 A strong market normally rises on increased volume so this is a concern. 6). 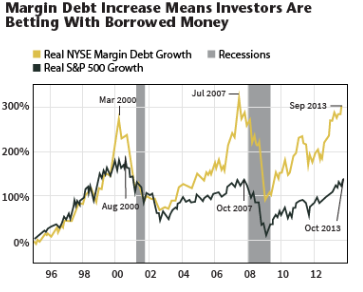 Margin debt is at levels seen in the early 2000s and 2007. People/institutions are borrowing large amounts of $s to buy stocks. This is a quicksand foundation supporting stock prices. 7). There is no fear. See item 2 - AAII bullish percentage. 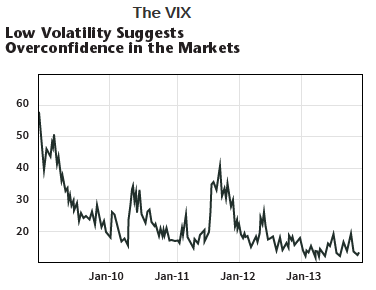 The VIX is known as the FEAR index. It has been low for several months. The last time you saw the VIX this low for this long was 2007-8. Caution is indicated. 8). 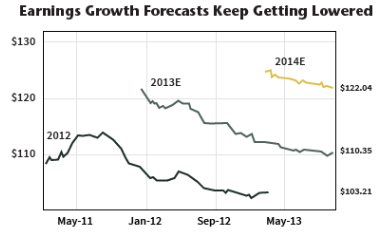 The MSM talking heads keep talking PEs based on 2014 forecasted earnings to predict higher stock prices. It is fairly normal for earnings forecasts to decrease over time so these 2014 projections should be viewed with some skepticism. 9). 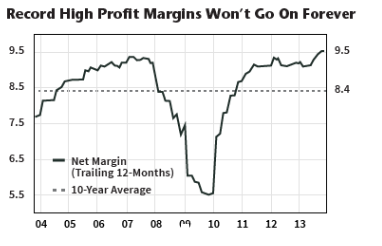 In 2013 the rate of revenue growth slowed down, profits rose primarily due to increased margins. There are limits as to how much companies can cut costs and increase margins and they are probably close to that limit. Future profit growth will depend more on economic growth. 10). See item 4 (CAPE). 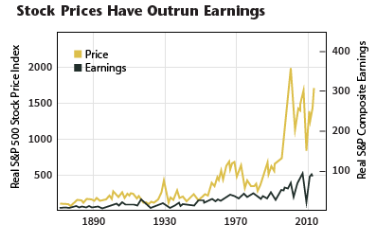 Even the regular PE is starting to get a bit high because in 2013 the increase in stock prices was due primarily due to increased PEs and not earnings growth. These are only some of the challenges the economy and stock market will face in 2014. There are items like ACA (Obamacare) that start to get more fully implemented over the next couple of years (partially postponed into 2015 by Obama). It seems unclear of the total impact of this. We know that state run health care in other countries have proven to be burdensome and ineffective. We also know that over 30 taxes/fees go in to effect in January. Resources diverted to health care cannot be spent on housing, autos, clothing and travel so this will have a dampening effect on the economy. It is uncertain how extensive this effect will be. There is also the Dodd/Franks bill that financial institutions have to deal with. This will probably increase the cost of credit. This may impact fees retailers can charge for the use of credit cards. The cost to the consumer of this added regulation by multiple government agencies is unknown at this time.